One of my fellow photographers excitedly pointed out a small spiderweb to me as I was preparing to leave my local marsh and I moved closer to investigate. At the center of the web was a small colorful spider of a type which I had seen before, but had never identified. I realized that I must have a peculiar reputation when others start to get excited about spiders on my behalf. I felt obliged to take some photos, given that my friend had gone to the trouble of spotting the spider for me, but I didn’t have any great expectations that they would turn out well. The spider was small and the angle of the web made it a little tough to keep everything on a single plane (and I was handholding the shot at close range). I really admire the artistry of spiders and their webs, however, and have not seen many this spring, so I took quite a few images and was pleasantly surprised with the result. 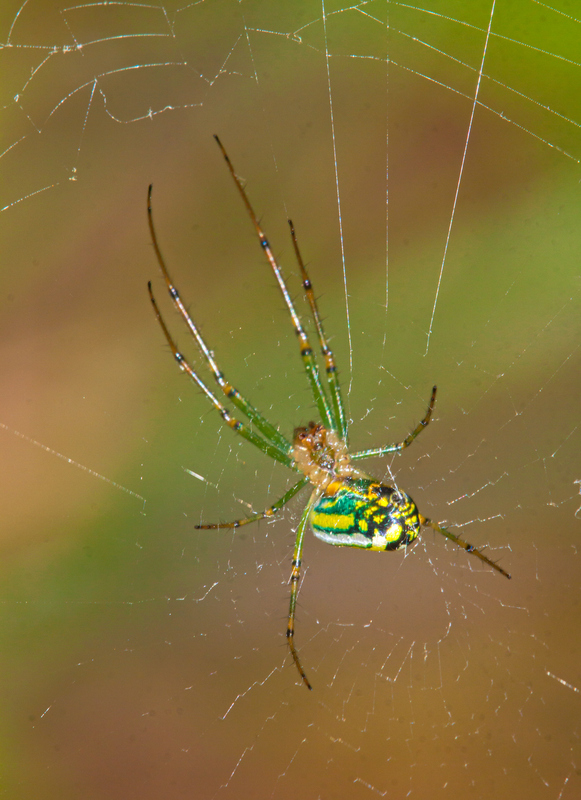 The spider probably is an Orchard Orbweaver spider (Leucauge venusta) or possibly the similar Leucauge argyra. As you may note, this is a kind of long-jawed spider with legs of differing lengths. It is an ongoing mystery to me how the spider is able to weave an intricate, symmetrical web with such asymmetrical appendages. 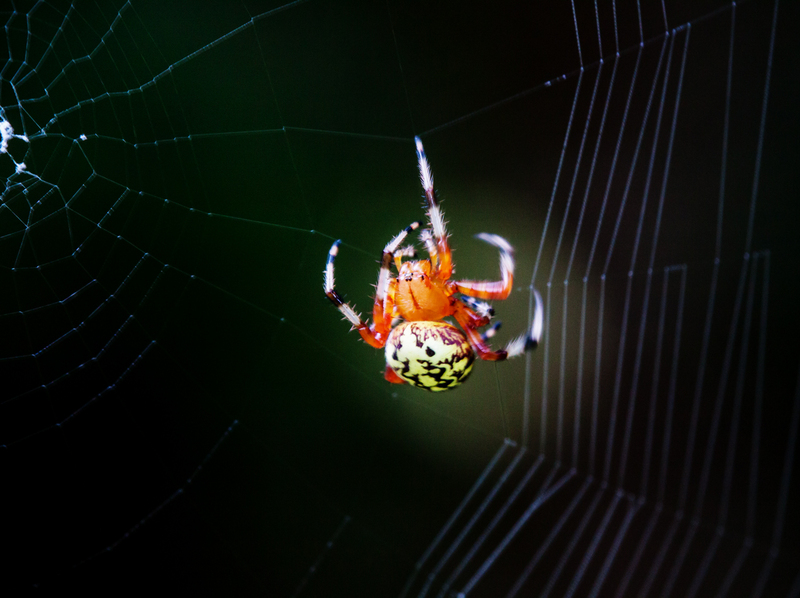 Out of all of the subjects that I photograph, spiders tend to be the most polarizing—readers tend to find spider images to be either creepy or beautiful. 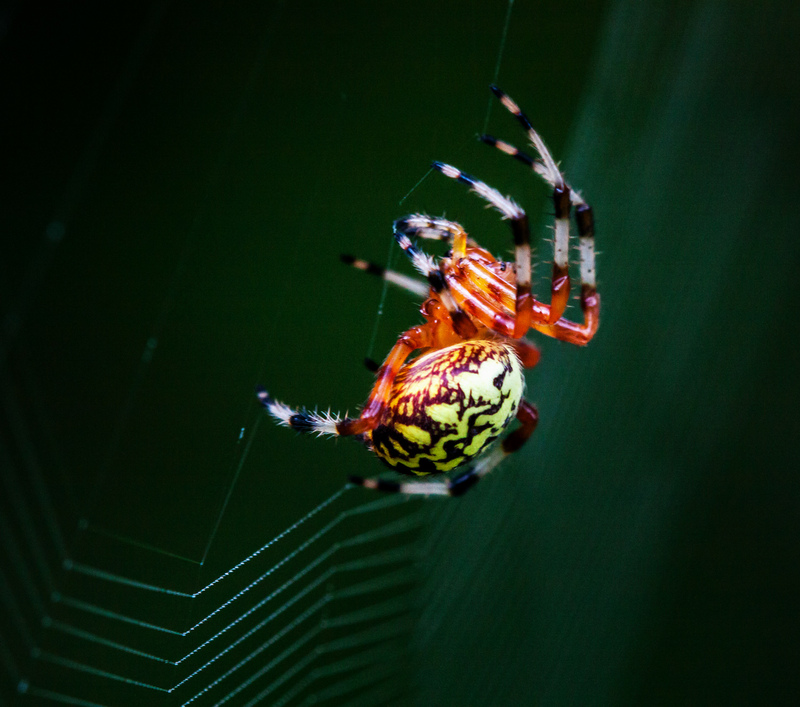 I hope that the majority of readers will view this colorful little spider as beautiful. On Halloween night, it somehow feels appropriate to post this photograph of a spider web that I took earlier this month. 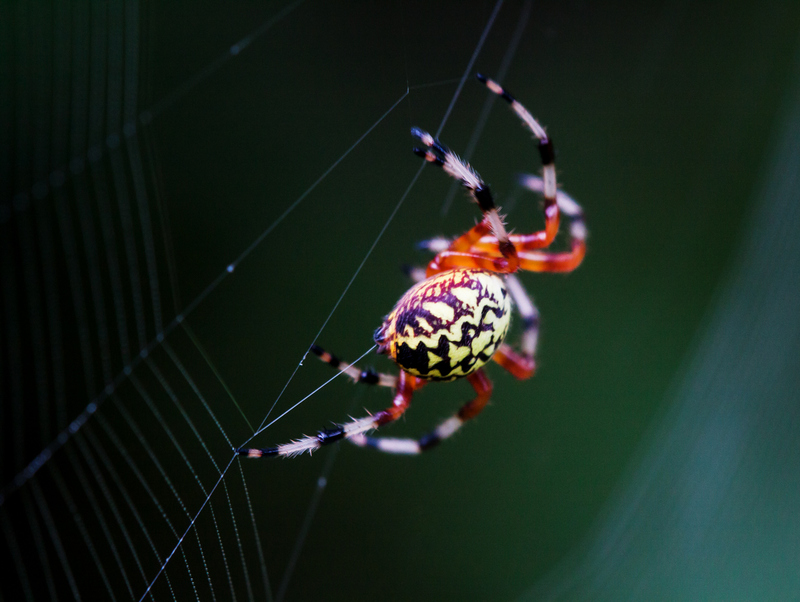 Some people find spider webs (and spiders) to be creepy, but I find them to be fascinating. 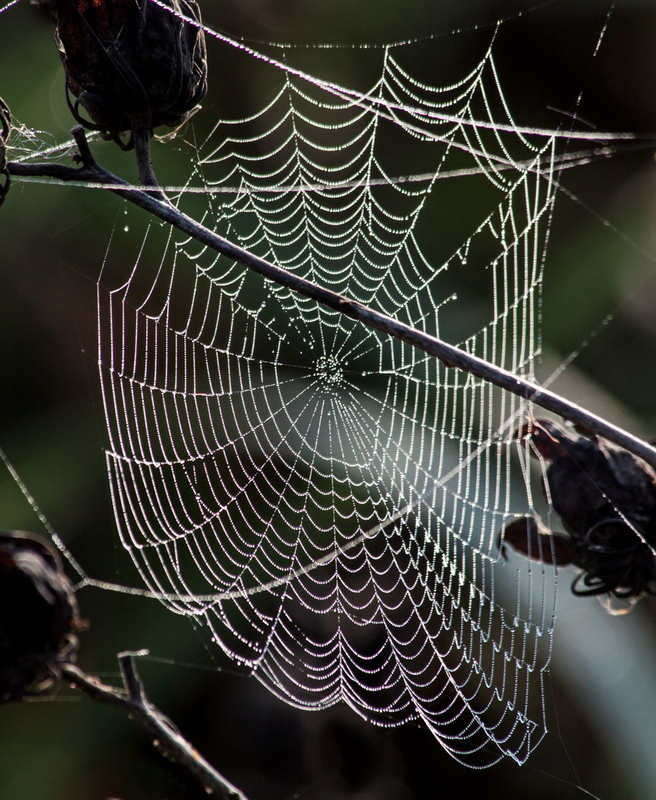 I look at spider webs as a form of beautiful natural art, filled with wonderful geometric shapes and designs and always marvel at the ability of spiders to weave them. 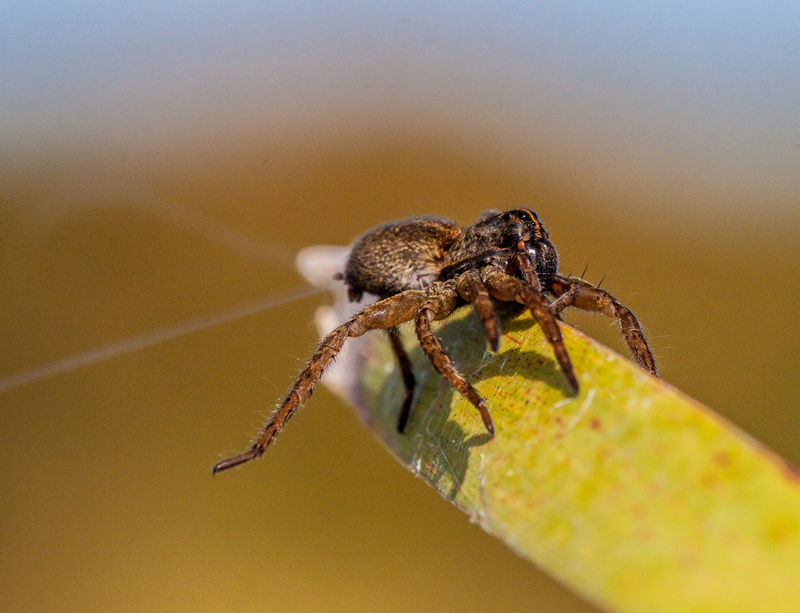 Here’s another shot of one of the numerous spiders that I observed yesterday at my local marsh, which I have not yet been able to identify. This one was pretty big and seemed to be putting out a lot of silk, one strand at a time. If you look closely, you can spot numerous eyes and a cool orange racing stripe down the middle of its face. I took this shot from a low angle so that I could capture the spider with the sky as the partial backdrop. I arrived early in the marsh on a cold fall morning when the dew and a touch of frost seemed to have combined to coat objects with a kind of frozen mist. I was hoping to find some large, beautiful spiders shining in the early morning light, as I had found repeatedly during the summer and early fall mornings. My initial scan found no spider webs at all, but suddenly I spotted one in the cattails. It was not large, but its rarity made it extra special. The structure is not very complex or symmetrical and the silk threads seem to be heavy-duty, rather than delicate. I wondered what kind of spider made such a web, but did not spot the maker of the web. Perhaps she’ll continue her handiwork for a little while longer—I’ll be checking each time I return to the marsh. A few days I posted a photo of a giant spider web (which one blogger said looked to be big enough to catch a dog) processed in a couple of different ways. I received lots of helpful comments about adjustments that I made or didn’t make. 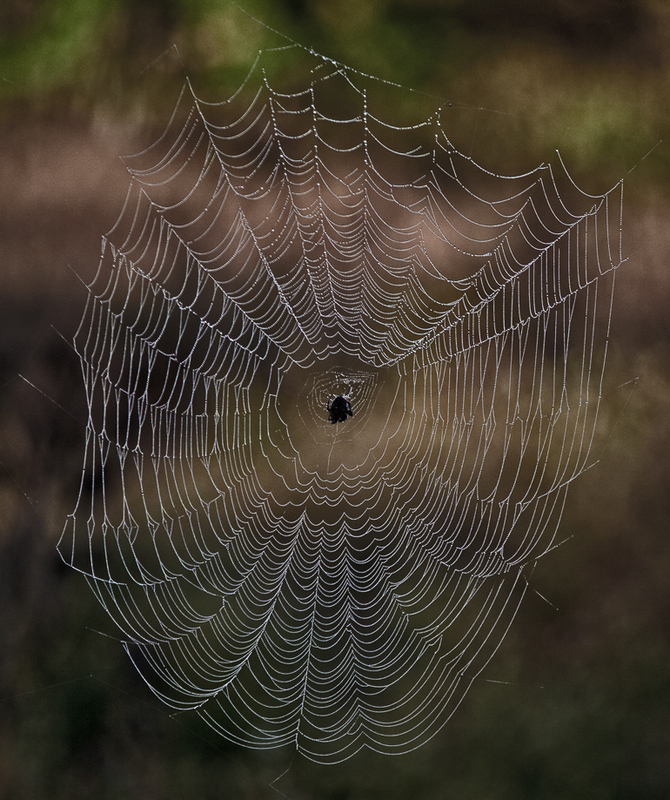 With those comments in mind, I worked on this photo of a different web that I photographed earlier in October. It’s not quite as big as the previous one, but is in better condition and the spider is still present. The web was suspended between two cattails and I had enough room to set up my tripod on the boardwalk that runs through the marsh, so hopefully my shot is pretty clear (although I confess that manual focusing is still a challenge for me). I may work on some more variations of this photo, but here is my initial effort. 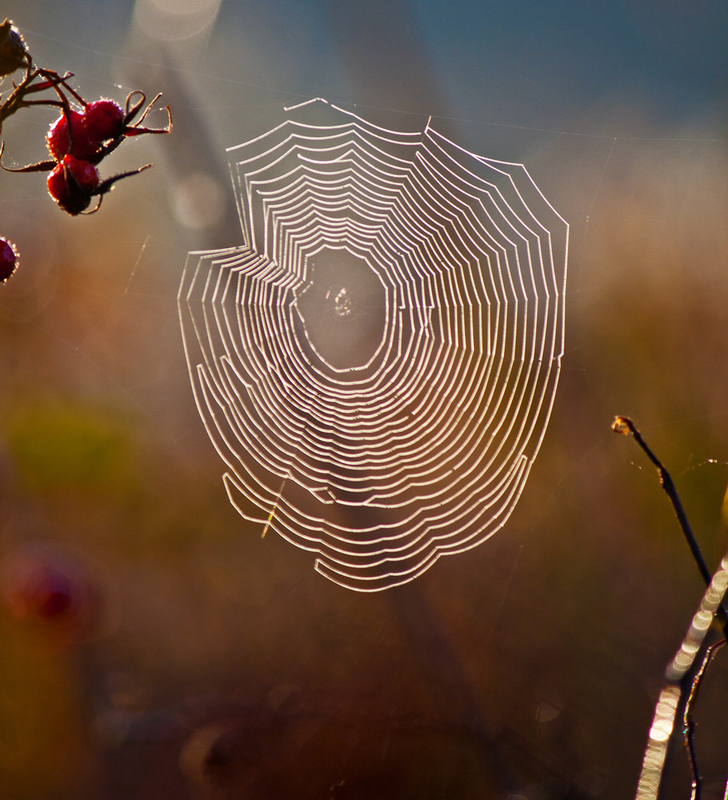 So what do you think of this spider web (click on it to see a higher resolution view)? 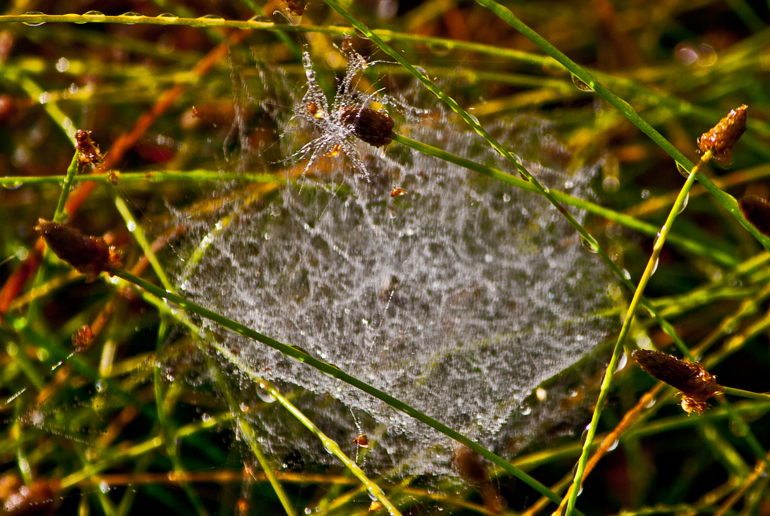 Have you ever woken up on a fall morning and noticed the dewy grass and bushes littered with spider webs? I don’t mean the beautiful geometric-patterned webs of the orb-weaving spiders, but webs that appear to be nothing more than loosely woven sheets of spider silk. Normally I don’t give them a second glance, but one morning this weekend I stopped and looked at one of them more closely. 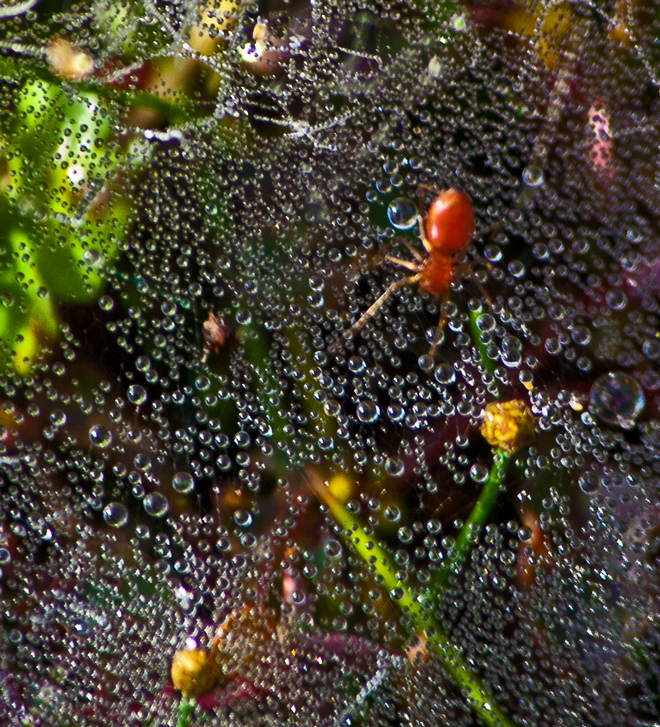 I discovered a beautiful little world, filled with tiny beads of water, captured by the threads of the web. I think the spider is a grass spider of the genus Agelenopsis. Wikipedia notes that the webs of grass spiders are not sticky, but the spiders makes up for that by being able to run really quickly. Here is a view of an entire web through a telephoto lens. I was on a walkway several feet above ground-level when I took the shots, so I was not able to get actual close-up shots. The photo is not a very good one, but it gives you an idea of how nondescript the web looked at first glance.